Get the latest scoop on PRG. Read about current news, events held and activities participated. 29 January – PRG Eyes Medical Tourism Market. 04 December – PRG, JPC launch collaboration. 27 October – PRG to include China partner in SPNB projects. 17 October – PRG’s Manufacturing arm surges 44% in HK Trading debut. 07 July – PRG Unit Furniweb’s Listing In HK Set For Mid-October. 03 July – Busy year ahead for PRG Holdings Bhd with focus on affordable housing projects. 14 June – PRG Holdings Bhd eyes more affordable housing projects to diversify revenue stream. 10 March – PRG look into Property Development to replace its manufacturing business as the largest income generator. 5 December – PRG low P/E based on latest financial results. 12 November – PRG Teambuilding was held at The Saujana Resort. 20 October – PRG Holdings launches RM600m maiden project at Jalan Ampang published in The Edge and China Press. 16 October – PRG 13th Bursa Listing Anniversary Dinner 2016 was held in Mandarin Oriental Hotel. For more videos and pictures, kindly visit our PRG Facebook page. 16 October – More videos on the PRG GoCare run can be found on our PRG Holdings Bhd Facebook page. 16 October – PRG GoCare Run video. 05 October – Charity run to benefit three causes. 29 September – More info about PRG GoCare run here. 23 September – PCSB is participating in the MBAM CSR Mangrove replanting program at Kuala Selangor Nature Park. 12 August – PRG GOCARE Charity run 2016 intro video. 11 August – PRG HOLDINGS BHD and GOCARE to co-organise charity run on the 16 OCTOBER 2016. 10 August – PRG GOCARE charity run targeting to raise at least RM10,000. 10 August – PRG upbeat on more property launches in 2H. 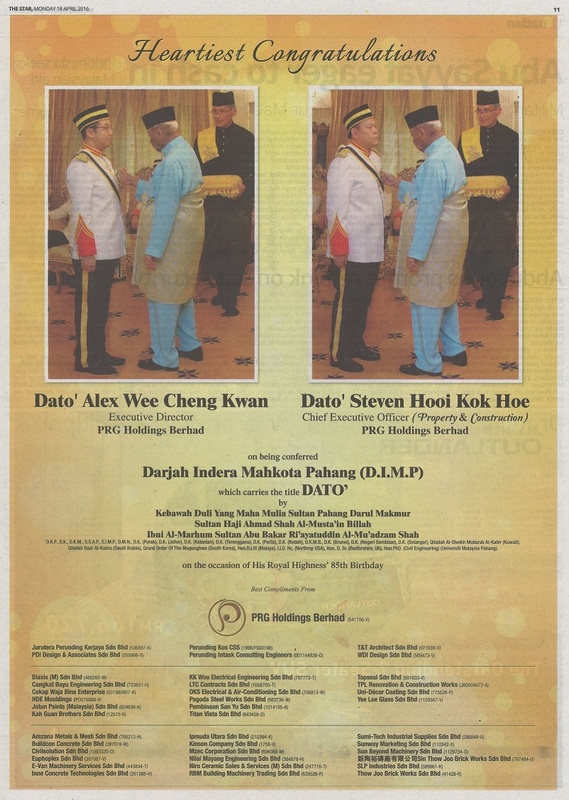 08 August – PRG GOCARE charity run advertise at THESTAR newspaper.